The New Development Bank plans to co-finance infrastructure projects with the Asian Infrastructure Investment Bank along the Belt and Road economies after more members join in, the NDB's vice president said on Sunday. 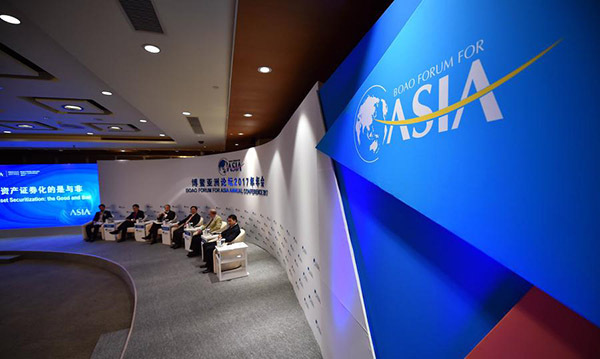 "There will be unlimited opportunities to co-finance projects with the AIIB in the future along the Belt and Road, because we share so much in common while selecting projects," Leslie Maasdorp told China Daily during the Boao Forum for Asia. One year older than its peer multilateral bank AIIB, the NDB was opened in Shanghai in 2015, founded by the BRICS emerging economies, which include Brazil, Russia, India, China and South Africa. "We are both interested in investing in projects that are sustainable, commercially viable and have long term economic benefits," he said. "Countries along the Belt and Road have huge demand for such projects, and we can work together to fill the infrastructural gap." Future projects can be those that would produce spillover effects to neighboring economies, similar to the latest one approved by the NDB, an offshore wind project located in Xiamen, Fujian province, according to Maasdorp. The wind farm is designed to have a total capacity of 700 megawatts, making it one of China's largest projects of this kind, according to an online announcement by the NDB in December. Maasdorp said one major difference between the two banks is that the NDB now only focuses on meeting the demands of five founding members, because the capital comes from the five, while AIIB has a universal procurement policy. But the policy might change in the future as the NDB looks at new members in the coming years, Maasdorp said. Similar to AIIB, the bank is keeping its door open to all members in the United Nations, Maasdorp said. Maasdorp said the bank welcomes applicants along the Belt and Road. The ultimate membership composition would be 80 percent of developing countries and 20 percent of developed countries, as the NDB wrote in its founding documents.